Osaki massage chairs come in a wide range of different styles, including the Pro Alpine, Pro Dreamer, and Pro Cyber. The chairs are manufactured from the highest quality materials and have a number of benefits to improve your overall physical and mental health. In fact, massage chairs manufactured by the company can help with pain relief, stress relief, improve posture, and improve alignment of the spine. Here are some of the most frequently asked questions about these massage chairs, with information on the benefits they can bring to your general health. Osaki website, or by phone or email. Osaki are known for their excellent customer service, and you will be able to speak to a member of staff if you have a query about one of their products, or just need some technical help. The Osaki Massage Chair online store is easy to use, with various navigation features that will direct you around the site. Individual product pages have more information on different massage chairs, and include high resolution photos, product specifications, and other important information about making a purchase. How can these chairs help with pain relief? One of the most important benefits of massage chairs manufactured by Osaki is pain relief. The chairs will use comforting vibrations and other massage techniques to provide an effective massage for anyone suffering with pain or shoulder ache. The massage chairs work by relaxing muscles that have become tired or overworked and are ideal for those who enjoy sport or spend time at the gym. An Osaki massage chair can help to repair the body in a quicker time frame, and can be used to ease body aches, strains, and pains. Spending time in one of these chairs can also be effective in helping with the symptoms most commonly associated with various health conditions, such as fatigue and nausea. Many people report that they experience a boost of energy after sitting in a massage chair, and are less lethargic and fatigued during the day. How can these chairs help with stress relief? When our bodies are stressed, our muscles can tense up, and we may experience nausea or headaches. Sitting in a massage chair that has been manufactured by Osaki can help to provide stress relief to the shoulders, neck, and head, area, as well as other parts of the body. The chairs will work to get rid of any stress that has built up over a prolonged period of time, and target various muscle groups in the body to relieve headaches and other symptoms. The massage chairs are easy to use and come with full instructions on how to assemble and maintain the product. They can be used by the whole family, and may be beneficial are a long day at work or college, or after spending time carrying out a strenuous activity such as an exercise class, playing sport, or spending time in the gym. How do these massage chairs work? Spending just 10 or 15 minutes on a massage chair can have a number of benefits to your physical and mental health, especially if you feel pain or soreness in your joints and muscles. A massage chair works by loosening the muscles and relaxing them using comforting vibrations and other techniques. Massage chairs manufactured by Osaki come with air bags and rollers which have been specifically designed to target different muscle groups, and these can be found throughout the design of the chair. The number of rollers, air bags and other features of the massage chair will depend on the exact product. You can also use different programs and settings to choose the intensity of massage strokes, allowing you to effectively customize your own massage depending on your circumstances. This can be beneficial if you want the massage chair to just work on one part of the body for example, or if you want a full body massage for rest and relaxation. Osaki has been quite instrumental in making quality massage chairs that have made it to the top. This time it introduces the Osaki OS-4000 Massage Chair, which happens to be one of the most popular massage chairs of 2015. The Osaki OS-4000 Massage Chair is more and more found in different places like workplace, doctors office,chiropractic doctors office, spas, executive offices and at home. Osaki has done a good job in making this chair very fashionable. It comes in several stylish colors like black, charcoal, creme and brown. Some say it looks like a pudgy leather robot while others think it looks like a futuristic therapeutic throne. In any case it definitely catches the eye and the Osaki OS-4000 Massage Chair stands for quality. care of the distribution of the gravity force over the whole body instead of one specific area. The OS-4000 Massage Chair has 48 airbags which focus on all major areas of the body. Airbag massage is comparable with highly effective deep tissue massage. The airbags are able to cover shoulders, neck, hip, arms, lower back, lower legs and even the feet. The OS-4000 Massage Chair has the most innovative rollers and kneading mechanism available in the market. With this technology the human hand is simulated in the way it grasps and kneads and in addition it can concentrate on a specific problem spot. 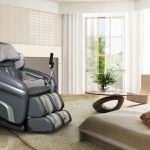 The OS-4000 Massage Chair has a specially designed 30inch roller that can deliver a massage to somebody that is 6 foot 4 to somebody that is 5 foot 4 tall. Another advanced feature is the Body Scan. With this technology it is possible to identify specific disorders of an individual and present them a far more customized massage. Say for instance you suffer from lower back pain or you require special focus on relaxation to help ease hypertension. The OS-4000 Massage Chair has the capacity to pick up these types of subtle nuances and can provide maximized massage treatments. The OS-4000 Massage Chair can be controlled by wireless remote control. Last but not the least positive feature of The Osaki OS-4000 Massage Chair is the Warranty program that comes with it. There is a 3 Year Warranty on the product no matter the location the Chair is commonly used in.